KCCA FC players celebrate Patrick Kaddu's goal. 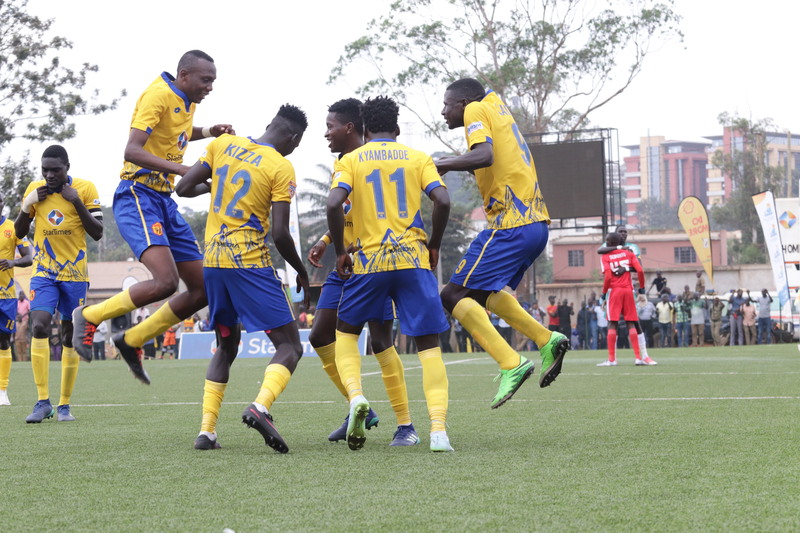 A Patrick Kaddu penalty was enough to separate KCCA FC from the West Nile Caterpillars who were not letting go of the Kasasiro boys in the StarTimes Uganda Premier League on Tuesday at Lugogo. Right from the start, Onduparaka proved they had come for business and put up a great performance that threatened the Lugogo setting. Caesar Okuthi and Viane Ssekajugo all tried to check the Kasasiro boys goalkeeper Charles Lukwago but in the end their efforts never resulted into tangible results. 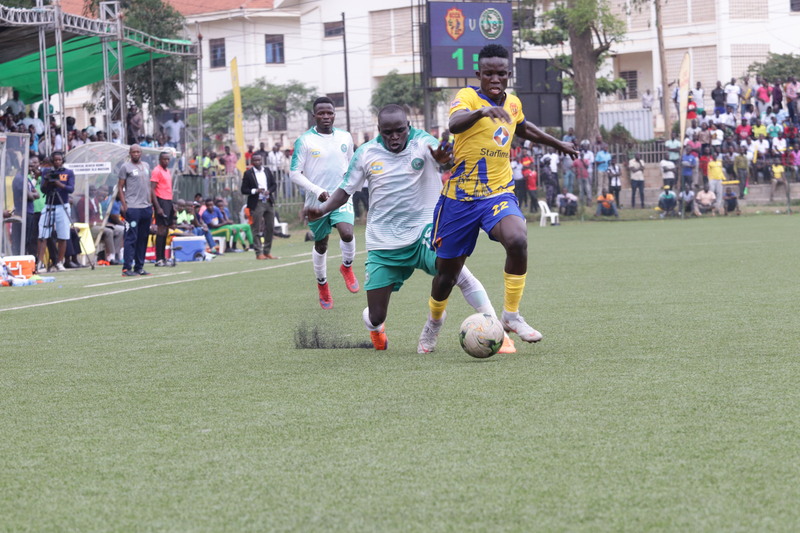 On the other side, the hosts were also raring to go with a number of attempts but the Onduparaka defence commanded by skipper Rashid Toha proved they had come to stay. Allan Okello tries to dribble past Onduparaka players. Things seemed not going the right way for KCCA who missed coach Mike Mutebi who watched the game in the stands due to the four match ban given to him. 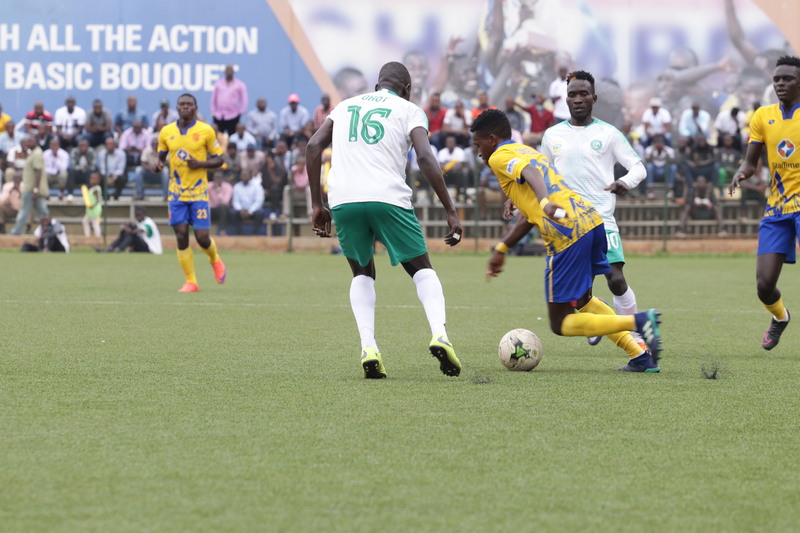 Both teams were moving bumper to bumper with each other until the 62nd minute when Allan Kyambadde was brought down in Onduparaka’s 18 yard box for the centre referee to point at the spot kick. 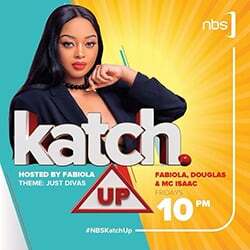 Kaddu made no mistake but put the ball into the back of the net to trigger his trademark dance strokes at Lugogo, before being joined by fellow Kasasiro boys. In the final minutes of the game, the visitors tried to stage a come back but all their efforts proved futile for the lucky Kasasiro boys who went on to register a slim win at home. Julius Poloto battles for the ball with an Onduparaka player. Speaking shortly after the game, KCCA FC Assistant coach Morley Byekwaso admitted his team has struggled in the last three games. “Because this is the second round, there will always be pressure from other teams.These challenges will keep on coming but we shall try to show our character,”Byekwaso said. He however noted that the win against Onduparaka was a “sweet” one for his team . Caterpillars coach Leo Adraa said despite losing, his team had closed the losing gap against KCCA FC. “One of the oldest teams in Africa was playing one of the youngest teams in Uganda and it is a big improvement from losing by seven goals to losing by only one,”Adraa said in relation to the previous results between the two teams at Lugogo. The win ensured KCCA FC maintain the lead at the top with 40 points, three ahead of Vipers SC who beat Nyamityobora one nil in Western Uganda.